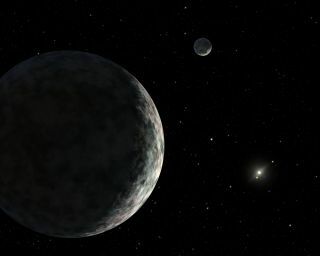 An artist's concept of the dwarf planet Eris and its moon Dysnomia. The sun is the small star in the distance. Eris was one of the first "dwarf planets" to be discovered in the solar system. It is almost the same size as Pluto, and its discovery directly led that former ninth planet's demotion. When Eris was first discovered in 2005, it was thought to be significantly larger than Pluto. Originally, it was submitted as the tenth planet in the solar system. Ultimately, however, Eris' discovery was a big reason astronomers demoted Pluto to dwarf planet status in 2006. That decision remains controversial to this day, making Eris' name fitting. Like almost all of the known dwarf planets (with the exception of Ceres), Eris lies in the Kuiper Belt that rings the outer solar system. But Eris is even farther-flung than Pluto, circling our star from about three times farther away. It takes 561 years for the distant dwarf planet to make a single trip around the sun, though it rotates once every 25 hours, making the length of its day very similar to a day on Earth. Eris’ distance allowed astronomers to make precise measurements when it passed in front of a dim star in 2010, an event known as an occultation. In addition to measuring its size, researchers were also able to conclude its shape, size and mass. The observations helped scientists determine that Eris' diameter is 1,445 miles (2,326 kilometers), give or take 7 miles (12 km). That makes it slightly smaller than Pluto. When New Horizons arrived at Pluto, it measured the diameter of the world to be 1,473 miles (2,370 km) across, about two-thirds the diameter of Earth's moon. The researchers concluded that Eris is a spherical body. And, by studying the motion of Eris' moon Dysnomia, they peg the dwarf planet to be about 27 percent heavier than Pluto, which means it's considerably denser than Pluto as well. "This density means that Eris is probably a large rocky body covered in a relatively thin mantle of ice," said co-author Emmanuel Jehin, of the Institut d'Astrophysique de I'Université de Liège in Belgium. Researchers think Eris' surface is probably composed of a nitrogen-rich ice mixed with frozen methane in a layer less than 1 millimeter thick. This ice layer could result from the dwarf planet's atmosphere condensing as frost onto its surface periodically as it moves away from the sun, they said. The observations also allow researchers to make another estimate for the surface temperature of Eris. The side of the dwarf planet facing the sun likely gets no warmer than minus 396 degrees Fahrenheit (minus 238 Celsius), while temperatures on the night side would be even lower, researchers said. Eris is one of the few dwarf planets to boast a moon. Named Dysnomia, after Eris’ daughter the demon goddess of lawlessness, the moon allowed astronomers to make more accurate measures of the planet than would have been otherwise possible, such as measurements of its density. The extreme distance of Eris, coupled with its small size, makes it difficult to observe the dwarf planet directly. That said, periodic observations are performed. In 2017, a team used the Atacama Large Millimeter/submillimeter Array (ALMA) to observe Eris and supplemented their work with data from the Herschel Space Observatory. The work was led by Csaba Kiss, a senior research fellow at Konkoly Observatory in Hungary. The observations show that Eris likely does not have "secondary dark terrains" and that the emissions in that wavelength likely come from the moon Dysnomia, which the authors described as large and dark. "Our results also highlight the great capabilities of ALMA in disentangling the thermal emission sources in the dwarf planet systems," stated their abstract submitted to the American Astronomical Society Division for Planetary Sciences meeting in 2017. A separate abstract submitted to the AAS DPS meeting in 2016 suggests that Eris may be geologically active. The dwarf planet has an albedo of nearly 1, which is close to that of Saturn's geyser-spouting moon Enceladus and other active bodies, the authors said. Even Pluto has regions on its surface with an albedo of 1, which implies geologic activity. The research was led by Bonnie Buratti, a planetary astronomer at NASA's Jet Propulsion Laboratory. Separately, a group of astronomers (including Alan Stern, the principal investigator of the Pluto mission New Horizons) has asked the community to reconsider the International Astronomical Union's definition of "planet." They propose that instead all dwarf planets be made planets, which would also include Eris.